Though the MacBook Pro included a number of enhancements to the final iteration of the PowerBook G4—a thinner case, a built-in iSight camera, a remote control with Apple's Front Row home media center software, an ExpressCard/34 slot, improved wireless reception, a larger screen and the new "MagSafe" power connector designed to be less prone to damage—there were also some notable omissions. The MacBook Pro no longer included FireWire800, s-video or modem ports (a USB modem was available separately), and the slot-loading SuperDrive no longer supported dual-layer DVD+R media. Though it shipped with a Serial-ATA bus, the hard drive capacity was reduced from 120 GB to 80 or 100 GB. The big news, however, was that the MacBook Pro included a dual-core processor, a first for an Apple portable. Though announced at 1.67 and 1.83 GHz, the MacBook Pro actually shipped with 1.83 or 2.0 GHz Intel Core Duo processors, with a 2.16 GHz processor available as a BTO option. The MacBook Pro shipped in two configurations: 1.83 GHz/80 GB/$1999 and 2.0 GHz/100 GB/$2499. Both configurations were speed-bumped in May 2006 to 2.0 GHz and 2.16 GHz, respectively, and were made available with a glossy screen as a BTO option. 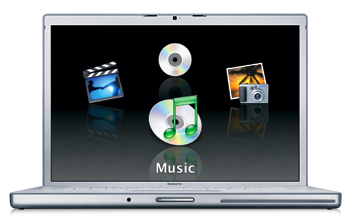 It was replaced in October 2006 by the Mac Book Pro (Late 2006).